i'm glad on so many levels that i've treated this as a wearable muslin. i'm not sure i'd have had the courage to start without that "it's only a trial run" feeling. and i'm still learning about the fit now i can see pictures of the finished article. there's no way i could have considered making the whole thing up but never wearing it, and without the skirt and belt i missed plenty of fitting issues so just mocking up the bodice wouldn't have worked for me. in terms of fit, it's fairly close to the pattern illustration, which shows a slightly blousy top, but i would prefer it a full size down next time. i can deal with the volume of the skirt if it's tempered by a lack of volume above the waist. i cut a 14 as that most closely matched my measurements (35.5-29-37), then added 2" to the waist at the bodice-fitting stage. in practice this was at least 1" too much, the skirt completely alters the hang of the bodice and the posture alteration from wearing heels makes it even more roomy. i wanted to test the pattern so i followed the instructions pretty much to the letter. it was intricate (10 pieces in the bodice) but mostly straightforward although i found the inset bodice/yoke seam an absolute pig to sew and ended up doing it by hand. i've since read around and seen that there are a number of different way of reinforcing these corners, and i think i'd pick something other than the seam binding strips that the pattern has you use. the puckering on the tucks is entirely my fault for using too heavy thread in my eagerness to get going. on the up side, the covered buttons were a joy to make. i was a little nervous as i'd heard they can be tricky, but i hand-stitched around the edges with a gathering thread and had no problems at all. i'm not happy with the belt, it was a bugger to turn and i couldn't get it to the shape i wanted, i also couldn't find a pronged buckle that i liked so i'm just using a slider with a snap under the tongue to secure it . i will definitely get self-buckle belt made for v2. i was fore-warned by the only review at pr about potential floppiness in the yoke. i didn't know quite how to go about interfacing it, so i relied on stitching the inner facings a little tight, to hold it all in, and it seems to be working very well. hopefully choosing a crisper fabric for v2 should help too. 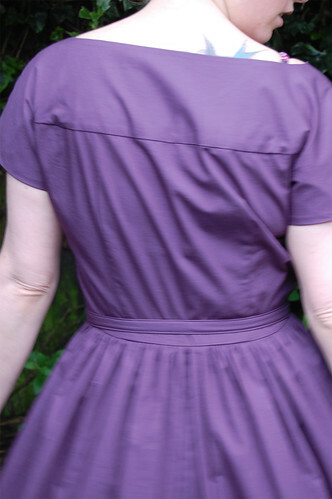 i think i may shorten the back waist in v2, this fuzzy picture gives an idea of where the belt sits, as well as the spare inches around the bodice. i plan to shorten v2 another couple of inches so it sits just above the knee. 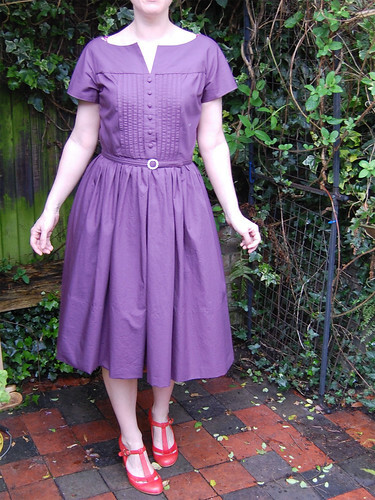 i cut to the shorter skirt length (for the long sleeved view which has a 2" hem instead of the ridiculous 12" hem for this version) but kept a deep hem (around 8"), so it ended up around 6" shorter than the pattern. i don't see that the deep hem really does make much of a difference in terms of the drape of the skirt so i won't bother in future, it's shockingly wasteful. an aside about underpinnings: yes i do have a strapless bra to wear it with! (although tbh most of the time straps don't bother me, especially if they match). here i'm wearing a petticoat , although a very soft one. i took some pics without and it's hard to tell the difference. i may look for a stiff one as i think it would help the dress significantly. you never know, once the memory of making M's has faded i may even try my hand at sewing one. 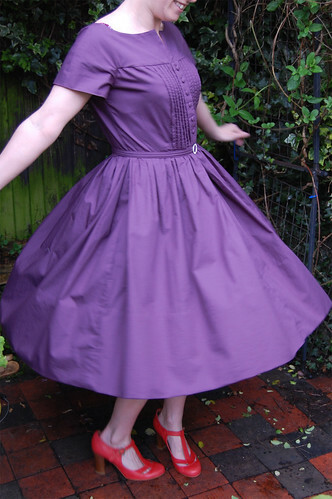 i don't want to totally rely on petticoats though, which is why i think making this in a crisp fabric then adding tucks at the hem just like the alice dress should work well for the finished article. oh and yes, my shoes are too big :( amazing what stands out in a photo that you never really noticed irl!